In addition to other splendid winter citrus, it’s Meyer Lemon season, through March. Meyer lemons are much sweeter and more flavorful than the Bearss and Lisbon varieties commonly found in American grocery stores (here are the different types of lemons). They have much less acid, making the juice sweeter and brighter. Here’s the history of Meyer lemons, discovered as an ornamental houseplant in China; along with how to use them, how to grow your own and a delicious recipe for Meyer Lemon Sorbet. 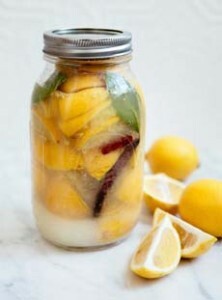 Today’s tip: Make preserved lemons, for yourself and as gifts. If you read this when Meyer lemons are not in season, grab any supermarket lemons. Preserved lemon is a condiment made of whole lemons that have been pickled in a brine of water, lemon juice, salt and sometimes, spices (essentially they’re pickled lemons, and the same treatment makes the pickled limes beloved of Amy March in Little Women). The lemons then ferment at room temperature for weeks, or even months. The result is a concentrated and earthy lemon flavor without too much tartness when made with regular lemons; and even sweeter when made with Meyer lemons. 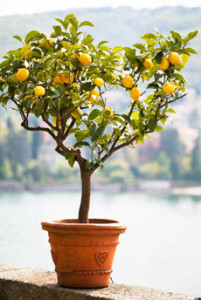 Meyer lemons were discovered as house- plants in China. You can continue the tradition in your own home. This mini tree is from BrighterBlooms.com. Preserved Meyer lemons are an umami food that have been called an “amazingly tasty ingredient,” guaranteed to convert you to their allure. The salt mellows out the bitterness in the rind and pith, and punches up lemonness, which is often described as “sunny”—just what’s needed during gray winter days. Preserved lemons are popular in Mediterranean, Middle Eastern and Moroccan cuisines. But you don’t have to make a tagine; you can use this bright condiment in Western cuisines, with anything from meatballs to tortellini. Preserved lemons can replace regular lemons—juice, slices or zest—in any savory recipe, from meat (beef, chicken, lamb, stews) and poultry to fish and seafood (a perfect pairing), grains (think beyond couscous to any cooked grains you enjoy), vegetarian stews, even salad dressing. Dips: Add a fine dice to guacamole, hummus and salsa. Try one teaspon per cup, and adjust to your preference. Israeli Salad: Preserve lemon is added by North African Jews. Garnish for Fried Green Tomatoes. Grain salads and pilafs: Add a dice of preserved lemon to barley, farro, rice, quinoa and other grains. Kebabs: Add them to the skewers of any meat, fish/seafood or vegetable kabobs. Try these Moroccan Potato Kebabs. Moroccan Baked Chicken & Olives is a classic. You can substitute fish fillets for the chicken. Pesto and other sauces: Start with a teaspoon or less. You want to add mystery rather than wallop. Pasta: Toss any pasta with olive oil, sliced garlic and diced or sliced preserved lemon. Here’s a recipe for Tortellini With Bay Leaf & Preserved Lemon. Soup Garnish: Slice and serve in ramekins along with chopped cilantro, croutons, green onions, chopped parsley and tomatoes, so people can customize their bowls of soup (here’s a recipe for Tunisian Chickpea Soup). Stews of any kind: Add a tablespoon or more to taste, even if no lemon is specified in the original recipe. Vinaigrette: Use a blender or food processor to combine diced preserved lemon with olive oil and vinegar or fresh lemon juice. Here are more recipes from Bon Appetit and the Huffington Post. Of course! No recipe list would be complete without a pizza with preserved lemon. It can be as simple as fresh basil, smoked mozzarella and preserved lemon; or fresh ricotta, preserved lemon, basil and za’atar*. Trust us: These are well worth making. It requires just 5 minutes of active time to make preserved lemons. Then, they sit and ferment for 3-4 weeks. Instead of making them in a quart jar, you can use two pint jars and give one as a gift. 1. COMBINE the lemons, chile and bay leaves and salt in a bowl, then pack them tightly into a sterilized quart jar with the back of a wooden spoon. Add the juice then seal the jar. 2. LET sit at room temperature for three days, turning the jar over once or twice a day. After three days, place the jar in the refrigerator for 3 weeks, until the rind has softened. They’re then ready to use. 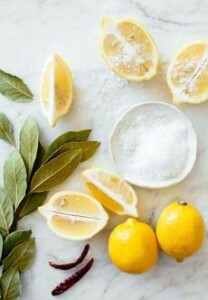 If you want to give them as gifts before the three weeks are up, tie a ribbon around the jar with a tag that tells the date on which the lemons will be ready; and that they’ll keep for a year in the fridge. *Also spelled zahtar, za’atar is a spice blend that is very popular in Middle Eastern cuisines. It is actually the word for Lebanese oregano, a member of the mint family Lamiaceaea, and known since antiquity as hyssop. The za’atar blend includes spices well-known in European cuisines, with the unique components of Lebanese oregano and sumac berries, which impart a tart, fruity flavor that differentiates za’atar from other spice blends. Traditional ingredients include marjoram, oregano, thyme, toasted sesame seeds, savory and sumac. Za’atar is used to season meat and vegetables, mixed with olive oil and spread on pita wedges or flatbread, added to hummus, and for a modern touch, sprinkled on pizza, especially ones with feta cheese. †You can first zest the lemons and use the zest in anything else you make today, from grains and vegetables to hot tea or sparkling water.